Thomas Edison, the father of modern R&D. Yesterday I talked about risk prone and risk averse, and used car driving as an example. If we have enough time to drive to where we are going, we should be risk averse, conservative, and stick to the tried and true route. If, on the other hand, we are running late, we may decide to roll the dice, become risk prone, liberal, and gamble on a possibly quicker way. And as I noted, when we are risk prone, our risk (surprise!) increases, and we are more likely to arrive even later than we would have going the conservative route. This certainly helps explain the populism of the left, and the support it draws from the various marginalized groups. It also explains why conservatives are right most of the time. Risk prone & averse are important ideas in both economics and animal behavior. Humanity, however, provides a third possibility. If for some reason we have plenty of time to get somewhere, we might become ‘unconservative’ for completely different reasons. We might begin exploring, looking for shortcuts, but also just looking at the scenery. I can remember one beautiful night when I had some time to kill before an event about a mile from my home, and so I just walked. Doing something different is more than simple pleasantry; we all understand the importance of conferences, and vacations, and leisure time. These provide a time to relax and recharge our batteries. And they also give us time to come up with new solutions. Who has not come up with a completely new idea while taking a walk, having a conversation with someone interesting, sitting quietly with coffee or a drink, or even sleeping late? Or going back to our metaphor, while leisurely driving the scenic route? If we’re in competition — and all business is — risk tolerant, liberal, nontraditional activity is critical; it’s called R&D, Research and Development. But R&D, as I noted in a response to a comment, ostensibly involves the whole company, it’s what accounting and marketing and manufacturing, and everyone, is supposed to do: analyze information, consider new possibilities, offer different, ‘liberal’ strategies. A good business, of course, does not immediately implement new ideas; they test them first, and introduce them prudently. And the really big businesses will limit their risk by simply going out and buying businesses that have tested and established some new idea. Nevertheless, trying new things is critical for any competitive entity, and that includes nations. The United States is frenemies with a large number of countries. At the far end we are offering carrots and sticks to countries as problematic as Iran, China and Russia. Nearer to us there are long-standing allies. We probably cooperate more with Canada and England than any other countries in the world, but we still compete with them over everything from market share to gold medals.1)And we spy on them. It was highly embarrassing that our spooks had tapped Angela Merkel’s phone, but I suspect most of the surprise was that we were caught red-handed, not that we did it. Cities are also in competition. All major cities host businesses that are huge profit generators for the local economy. Some of those business concerns are quite ‘liberal’, i.e., they produce constant innovation, and thereby derive astronomical profits from intellectual properties. This allows (and requires) them to attract top-level talent and pay them generous salaries, which leads to diffuse luxury and more benefits for the city, including generous cultural and charitable contributions, and eventually, spin-off businesses & start-ups. All of these generate taxes which can – if intelligently invested – improve education and the general quality of life. Just because these ‘liberal’ concepts are important in business, of course, does not mean that liberal ideas in are valuable within the social fabric. But as I noted previously, abolition of slavery, equal rights for all races, and women’s suffrage, were all liberal ideas at one point, and by definition, the conservative approaches of the time fought against them. That is a far cry from the issues today, with Muslims and atheists and LGBT and political extremism, of course. In competition, cities aggressively recruit the high-tech, high-innovation companies we just mentioned. It turns out, however, that the high-tech workers who staff and found such companies, are not attracted by the size of the local economy, by tax-breaks, by the eagerness of local officials to recruit them, nor by the big-ticket stadiums and similar venues that so many cities purchase. As Richard Florida notes in his series on The Creative Class, innovators and creative thinkers locate in ‘cool towns.’ Cool towns are those which provide arts, culture, restaurants, bookstores, and inviting public spaces. But what Florida found to be the strongest correlate of a cool town, is tolerance. Because if you think about it, the people who generate arts and culture and public innovations are often diverse, as are the workers who provide the brainpower for high-innovations industries. Visit Google or SUN or Stanford or MIT. In high-tech, high-innovation industries, people are judged exclusively on the content of their character and creativity. Ground-breaking industry hires people exclusively on their ability to produce solutions, write code, design hardware, or manage complex systems. Innovators are male and female, black and white and brown and red and yellow, straight and L and G and B and T, Christian and Muslim and Hindu and atheist, radical left and right and anarchist and Bieber Belieber and everything in between. The people who manage those industries couldn’t care less about your skin color, religion, sexual orientation, or political views. They can’t afford to. Competitive organizations are risk obligate.2)I think I coined that term. If any of you know of a similar word or phrase in business or elsewhere, please comment below. They need creativity, not conformity. But then, that’s part of the problem: conformity, by definition, excludes variation, innovation, diversity, risk. Remember, we started this discussion with the Bakhtiari, a group who are bound to extreme conservatism, because trying something new could spell death for everyone. Again, most of life is conservative. In many ways, hi-tech corporations are still managed as corporations were in the past, and the definitions of work and revenues closely resemble what they have been throughout history. And for all of the creative brain power contained with their campuses, Harvard, Stanford and similar schools are, in some ways, some of the most stilted, reactionary organizations you can find. When we manage a company – or a nation — we need to focus on what is critical to our goals, and ignore everything else. We cannot afford to judge someone on the superficial, we need to look at each person, one by one, and judge him or her on the ability to contribute. We need to abandon the broad brushes of creed, color and conviction. To compete in the modern world, countries, companies, and cultures are risk obligate. Those that focus on the essential will remain competitive, they will design the future. Those who do not will falter, fail, and be left behind. 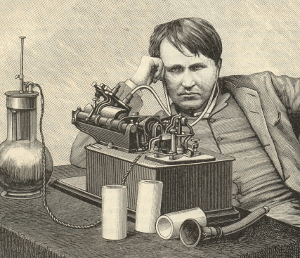 Image: Thomas Edison, courtesy of Wikimedia.org. 1. ↑ And we spy on them. It was highly embarrassing that our spooks had tapped Angela Merkel’s phone, but I suspect most of the surprise was that we were caught red-handed, not that we did it. 2. ↑ I think I coined that term. If any of you know of a similar word or phrase in business or elsewhere, please comment below. If “liberal concepts are important in business”, and the right thinks the government should be run like a business, then why would they be against liberal concepts? In trying to teach or stimulate creativity, we in that educational field, encourage students to take risk. You can learn as much or more from making mistakes that from getting it right all the time. There is one trait that has some marginal benefit to an organization that does R&D, even when an individual is highly creative. For lack of a better term, I’ll call it “plays well with others”. If the most creative person cannot collaborate or interact with others in the organization, their creativity will not be of maximum use to the organization. In large companies, there is some group/division/whatever that is dedicated to blue-sky research. New ideas, things that have never been tried, etc. This is where you need the most creative minds and can tolerate the most eccentricity (i.e., the folks who do not always play well with others). As an idea progresses from R&D to commercialization, it goes through additional groups/divisions/whatever that determine how to package the idea, how to integrate it into existing products/processes, or how to establish it as a new line of business. This part of the organization has to work with and within existing businesses, so the ability to play well with others becomes more important.